You don’t have to grow tobacco to have reason to worry about tobacco mosaic virus. Tomatoes are highly susceptible to this disease that can be carried on tools, clothing, cigarettes, and, yes, even the saliva and other bodily excretions of smokers. This tenacious virus can stay alive even after its host is dead, and it can withstand extreme temperatures. In addition to tomatoes and tobacco, the tobacco mosaic virus (TMV) has been found on over 350 different plant species, including cucumbers, many flowers and ornamental plants, and all members of the nightshade family, such as eggplant, potatoes, groundcherries, tomatillos, and peppers. While they may not show symptoms, grapes and apple trees can also become infected. Tobacco mosaic virus starts out as nothing more than paler than normal green between the veins of young leaves. This lightened area quickly becomes mottled, leaving a green, white, or yellow mosaic pattern. Bumpy wrinkles may also appear, in a behavior known as rugosity, and leaves may appear distorted or stringy, or exhibit cupping. Leaf veins may also turn yellow, and yellow streaking on the leaves may also occur. Many of these symptoms can be mistaken for signs of chemical overspray, but the mosaic pattern is usually distinct enough to rule this out. While this disease does not kill plants, it can stunt them severely. Infected leaves soon die, leaving dead patches in the plant and reducing production by up to 20%. Fruit that is produced is often discolored and deformed. How is tobacco mosaic virus spread? Unlike many other diseases, which are spread by sap-sucking insects, such as thrips and aphids, tobacco mosaic virus is mostly spread by direct contact. Tobacco mosaic virus has also been spread by chewing insects, such as grasshoppers and caterpillars, and by bumblebees, as they pollinate flowers. Plants infected with tomato mosaic virus must be removed and destroyed. According to the Michigan State University Extension, you can prevent the virus from moving onto uninfected plants by spraying them, just before transplanting, with a 20% nonfat dry milk solution. This spray can also be used on containers, walkways and other surfaces. The milk solution coats the virus, rendering it inactive. The milk treatment only works while the milk is wet. Quarantine all new plants until you are certain they are pest and disease-free. Wash your hands before working in the garden. Wear garden shoes, and not street shoes, when working in the garden. Avoid taking cuttings from potentially infected plants. Crop rotation can help break the disease triangle, though this virus is tough. *Check plant labels for the letters V, F, N, T or A. These symbols indicate a resistant to verticillium wilt, fusarium wilt, nematodes, tobacco mosaic virus or alternaria stem canker, respectively. According to a study conducted by the National Institutes of Health, all brands of cigarettes studied tested positive for tobacco mosaic virus, while only 53% of those viruses were viable. Also, 45% of the saliva samples taken from smokers tested positive for tobacco mosaic virus. So, smokers and users of other tobacco products, please wash your hands before entering your (or someone else’s) garden, and always throw your butts in the trash. Thank you. While it may sound like a short, reckless redhead, tomato bushy stunt is a viral disease of tomatoes. The strange thing is, we don’t yet know where it comes from or how it gets to our tomato plants. Most diseases are spread by vectors, often sap-sucking or leaf chewing insects. When it comes to tomato bushy virus, we don’t know how it spreads, though many experts believe it may be spread through irrigation water. Contaminated seed, sewage, and tools may also be guilty. The virus is thought to enter plants through damaged roots. And tomatoes are not the only plants at risk. First identified in tomatoes in 1935, this is not an economically significant disease, but it can cause problems in your home garden if it gets established. Apples, artichokes, cherries, grapes, hops, sweet peppers, chili peppers, eggplant, and tulips can also become infected, and the virus can cause severe leaf dieback of many lettuce varieties. Plants infected with the tomato bushy stunt virus have smaller than normal leaves which are cupped and curled downward. New leaves are crinkled and twisted, with dead tips. Infected plants produce more lateral shoots, creating the bushier, though often stunted appearance. Lower leaves may have a purplish tinge and tend to be chlorotic. Tomato bushy stunt causes a significant reduction in fruit production. The fruit that is produced, well, let's just say it doesn't look very appetizing. Since damaged roots create a point of entry for this and other diseases, avoid digging once plants are established. Instead, feed plants by top dressing and banding, and disinfect tools regularly. Once the virus is present in the soil, it is suggested that long crop rotations, of 4 or more years, are suggested. Infected plants should be removed and tossed in the trash. Tomato yellow leaf curl is a devastating viral disease of tomatoes that made its way to California in 2007. Mostly limited to greenhouse environments, this disease can wipe out all of your tomato plants, so you need to know what it looks like. This disease is spread by whiteflies and leafhoppers, and it is not limited to tomatoes. Other members of the nightshade family, such as peppers, can also be infected, as well as beans and many as yet to be identified weeds. Most often, the disease is spread through contaminated plants. Infected tomato plants tend to grow unusually upright, while being stunted. This occurs because the virus shortens the internodes. Internodes are the spaces between the nodes where leaves emerge. Shortening the internodes makes the plant look bushier, but not healthier. 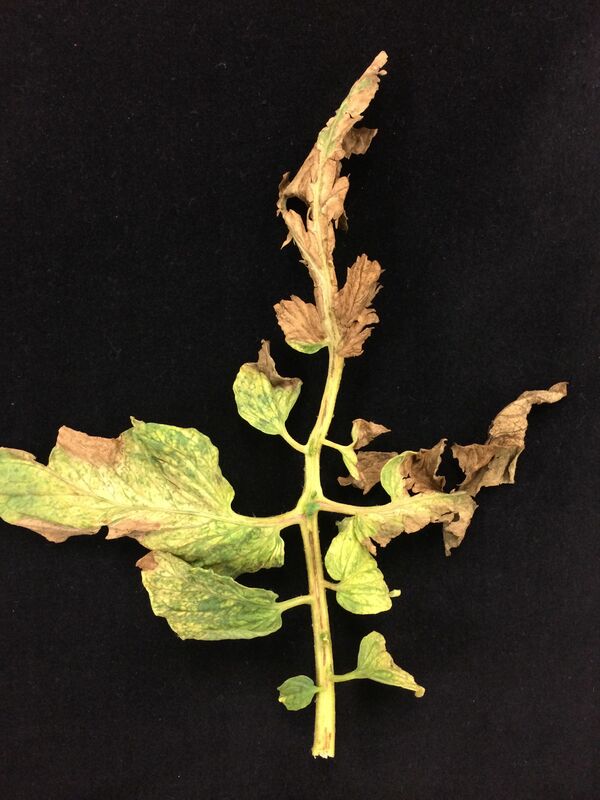 Tomato leaf curl virus also causes up to 100% flower drop, which means no harvest. The most obvious symptom of tomato yellow leaf curl is the leaves. Infected leaves are smaller than normal, crinkled, and curled upwards. They also tend to turn yellow at the edges and between the veins. Unfortunately, many other viruses have similar symptoms. If you believe you have a plant infected with tomato yellow leaf curl, contact your local County Extension Office right away. Specific varieties of whiteflies (Bemisia​) are responsible for transmitting this disease. If you look closely, you can see that some whiteflies hold their wings tent-wise, over their bodies, while others hold their wings flat. In the same way, some nymphs will have smooth edges, while others have a fringe of filaments. To see this level of detail, it is relatively easy to take a piece of clear packing tape and wrap it around your hand the same way you might to remove lint or pet hair from a pair of paints and capture the whiteflies on the tape. Then you can use a magnifying glass or hand lens for a closer look. It is the whiteflies that hold themselves under a tent and whose nymphs have smooth edges that carry the tomato yellow leaf curl virus. Leafhoppers are also believed to carry and transmit the disease. Tomato ringspot is a viral disease that can kill far more than your dreams of summer sweet salsa. This virus infects an astounding number of other plants and it is fatal. In addition to tomatoes, the tomato ringspot virus also infects stone fruits, apples, grapes, cucumbers, cowpeas and other beans, strawberries, currants, soybeans, and caneberries, including those luscious raspberries and blackberries. Adding insult to injury, this disease can also infect begonias, geraniums, iris, hydrangeas, and many other popular garden flowers. Sadly, tomato ringspot is an incurable, highly contagious disease. Infected plants (and their neighbors) must be removed and destroyed to prevent further spread. The virus responsible for tomato ringspot can be carried through the air, on pollen, or by dagger nematodes in the soil. As these nematodes feed on roots, the virus is transferred to healthy plants. Dandelion seeds can also carry this disease. Yellow bud mosaic causes lower branches to lose leaves, moving upward into the canopy as the virus spreads. Leaf veins on either side of the midrib may turn white, and leaflike growths, called enations, may grow along the midrib on the underside of the leaf. This is usually seen on infected almond, cherry, nectarine, peach, and plum trees. Prunus stem pitting causes later then normal leafing out. Leaves look pale and tend to wilt in summer, turning red or purple earlier in the season than is normal. Fruit size, quantity, and quality are significantly reduced. All of this is because the virus interferes with the flow of water and nutrients through the graft union, effectively starving the tree. These symptoms look very much like root damage caused by rats and voles, girdling roots, and fungal diseases of roots. The difference being that the tomato ringspot disease causes the bark, both above and below the soil line, to thicken and become spongy. This weakened area often allows the tree to topple over. Before that happens, you will also see pitting in the sapwood of the trunk. Usually the tree dies before pitting is seen in any branches. In a word - you can’t. The disease is incurable and infected plants put nearby plants at risk. The only thing you can do is remove the infected plants, and those nearby, and burn them or toss them in the trash. Just because symptoms disappear does not mean the infection is gone. Plants that no longer show symptoms are still carrying the disease, which can then spread throughout the garden. Once plants are removed, the affected area should be allowed to go fallow for at least 8 months, to starve out any dagger nematodes that may be lurking underground, and remove any potential disease-carrying weeds. Yes, removing plants from the garden or landscape is disappointing, but having to remove even more plants because of an initial delay could be both costly and heartbreaking. Tomato pinworms are the larval form of a moth that prefers feeding on members of the nightshade family. This means tomatoes, eggplants, and potatoes are at risk. It also means weeds and native plants in the same family can harbor these pests. Tomato pinworms (Keiferia lycopersicella) are predominantly found in areas with mild winters. They can also appear in greenhouses, so be sure to put new plants into quarantine until you are sure they are pest free. Eggs are pale yellow, at first, but then they turn bright orange, just before hatching. Larvae appear dark with light bands. The moth is very small, and a mottled grey with long antennae. After eating their fill, larvae then drop to the ground and form a loose cluster of sand grains around themselves, in a form of pupa. Two to four weeks later, they emerge as adult moths. There can be 7 or 8 generations a year. Because there are so many generations each year, and because generations can overlap, serious infestations can decimate your tomato plants. ​In areas with mild winters, tomato pinworm eggs and larvae can overwinter in the soil, on tools, or in buckets or baskets. Closely monitoring plants for signs of infestation is your first line of defense. Pheromone traps can be used to monitor for the moth and mating disruptants can make it more difficult for adult males and females to find each other. Be sure to thoroughly compost or remove plant residue at the end of the growing season, and always put new plants into quarantine. Commercial growers use insecticides on the first and second instars, but later instars are protected by their spun tents and by being inside the plant. This is one pest that is hard to get rid of, once it becomes established. Moderate infestations can be slowed by not planting early and late season tomatoes the same year. To manage badly infested areas, the host crops must not be planted for a year or two, to break the tomato pinworm lifecycle. Crop rotation is not effective, as the moths simply fly from one part of the garden to another. There are right ways to water trees, and wrong ways. Watering a tree the wrong way can make it susceptible to fungal disease, such as crown rot, and water-stress. While roots are meant to be exposed to soil and water, bark is not. While you can certainly water your trees with a hose, irrigation rings can save time and provide the water more slowly, preventing runoff. Irrigation rings are handy tools for preventing shade tree decline and conserving water. Where do trees need water? If you’ve ever stood under a tree canopy when it’s raining, you know that most, but not all, rain water is deflected away from the trunk by the leaves. The leaves farthest from the trunk form what is know as the tree’s drip line. Trees have evolved in ways that protect the trunk from excessive moisture, while allowing rain water to reach tree roots. Roots that grow beyond the canopy absorb the lion’s share of rainwater. You can mimic this action by providing irrigation water in a ring at the drip line of mature trees. Irrigation bags are large bags that wrap around tree trunks and slowly deliver a specific quantity of water. These are especially useful for large plantings. The bags must be removed when not being used to reduce moisture buildup and to facilitate respiration. Ooze rings work similarly to irrigation bags, but without touching the trunk. Tree ring irrigation contraptions (TRIC) are DIY kits that create a singular drip tube for a tree, using adapters, tubing, and a filter. Like other drip irrigation systems, these are easily clogged, especially when you have hard water, as we do here in the Bay Area. Soaker hoses can be spiraled around a tree, starting from the middle of the tree’s canopy and ending just beyond it. Or, you can do what I do, which is simply to dig a shallow trench, 4” deep and wide, in a circle under or slightly outside of the drip line. If you have a semi-dwarf tree with a canopy that is 8’ across, and a trench 4” wide and deep, that trench will hold approximately 20 gallons of water. One added benefit of the trench method is that it helps keep turf at a distance. This type of irrigation ring is not suitable for newly planted trees. Newly planted trees need water close to, but not touching, the trunk. This is where all the roots are. As the tree becomes established and the root system spreads out, you can start using a trench irrigation ring. Of course, it’s a good idea to dig the trench before the tree’s roots reach that area. In each case, the benefit to the tree is that water is allowed to seep into the soil slowly enough to be absorbed by the tree, rather than running off as urban drool, or percolating downward where tree roots cannot access it as well. And don’t forget to mulch under trees, keeping the mulch 6” away from the trunk. This will reduce water needs, thwart opportunistic weeds, and stabilize soil temperatures. Sugar volcanoes are a tree’s response to boring, disease-carrying insects. Now, when I say boring, I do not mean dull witted conversationalists. These pests are invasive shot hole borers that chew holes through bark to get at the sugary, nutrient rich sap found in the cambium layer. Borer entry and exit holes, while very tiny (0.03” in diameter) compromise a tree’s outer layer of defense. As the beetles bore into the wood, they carry with them three different species of fungal spores. These fungal spores enter the tree, bringing Fusarium dieback. Fusarium dieback is a fungal disease in which fungi block a tree’s vascular system, halting the flow of water and nutrients. Trees infected with Fusarium dieback must be destroyed and disposed of by a professional arborist. Peach, citrus, and pecan are just a few of the more than 200 tree species impacted by this problem, as are grapevines, but the sugar volcano is specific to avocados and box elders. Exudates are secretions. When an avocado tree is first attacked by shot hole borers and Fusarium dieback, it will respond by pushing a sugary exudate out of the borers’ entry and exit holes. This sugary secretion often includes frass and sawdust. As it dries, this sugary exudate forms a white, crusty ring or cone-shaped patch on the affected branch. And these crusty white patches, dear readers, are sugar volcanoes. Geraniums are cheerful flowers, but cutleaf geraniums are pesky weeds. The name Geranium is incorrectly applied to the common, round-leafed flowering plant found frequently in German window boxes and Mediterranean landscapes. That plant, along with 200 or so cousins, rightfully belongs in the Pelargonium family. The cutleaf geranium, however, is something else entirely. Cutleaf geranium, also known as cut-leaved cranesbill, is native to Europe. Now found predominantly along the western and eastern seaboards, cutleaf geranium can form a carpet that blocks other plants from growing. Cutleaf geraniums (Geranium dissectum) have disk-shaped, or orbicular, leaves with deep cuts, hence the name. The underside of leaves and stems may occasionally be red in color. Young plants grow in a rosette fashion. When growing in turf, these plants will stay prostrate, or low to the ground. In other locations, plants can reach 2-1/2 feet in height. The forked stem is hairy and those hairs, or trichomes, can emit fluids. Tiny pinkish-purple flowers have 5 petals and tend to appear in pairs, from March through October in California. Fruits are a 5-part carpel in the shape of a stork’s head and beak. As the seeds mature, each of the 5 parts curls back to release the seeds. Those seeds are round to oval and covered with tiny notches. If you pull up a cutleaf geranium, you will see a thin, shallow taproot with fibrous lateral roots. Cutleaf geranium can grow as either an annual or biennial plant, and is commonly found in disturbed ground and abandoned areas. Each plant can produce up to 150 seeds and those seeds can remain viable for 5 to 10 years. As with most the weeds, it is best to start controlling it early, before plants have a chance to go to seed. Hoeing is the best control. You’ve read the word countless times but what, exactly, are bracts? Bracts are specialized or modified leaves. Bracts are generally associated with a reproductive structure. That reproductive structure may be a flower, a cone, or an inflorescence. An inflorescence is a cluster of flowers. Bracts rarely look similar to other leaves on the same plant. They may be smaller, larger, a different shape, or a different texture. Plants with bracts are said to be bracteate or bracteolate, while plants without bracts can be referred to as ebracteate or ebracteolate. Very small bracts are called braceoles or braclets. Botanically speaking, bracteole are any bracts that occur on a pedicel, instead of under it. Pedicels are the tiny stems that hold individual flowers within an inflorescence. The presence of bracts, or lack thereof, can help you identify plants. The delicious leaves that surround an artichoke flower are also bracts. Tiny banana flowers are protected by bracts. In many cases, what you think are flower petals are actually specialized bracts, called epicalyx. Dogwood, hibiscus, poinsettia, and bougainvillea are common examples of bracts looking like flowers. Occasionally, you may see an epicalyx formation in strawberry flowers. The whorl of short green leaves that surround the base of many flowers, such as sunflowers, is made up of bracts. This particular arrangement of bracts is called an involucre. Two large bracts coming together, or one large bract forming a sheath, is called a spathe. Iris, crocus, and palm spathes enclose flower structures as they develop. Peace lilies form flowers on a spike, called a spadix, which is shielded by a large white spathe. ​Cereal grains, such as wheat and millet, and the grasses found in your lawn, have tiny florets that are held in a pair of bracts. The upper half is called the palea and the lower half is called the lemma. Each group of grass flowers, called spikelets, also have a pair of bracts, called glumes, at the base. When grain is winnowed to remove the chaff, the chaff being removed is made up of those bracts. Pine cones are covered with scales used to protect seeds. Female cones have two types of scales, bract scales and seed scales. Bract scales grow under seed scales. This positioning is called subtending. Bract scales are more obvious at the time of pollination. Very often, seed scales will grow over bract scales as seeds mature. The next time you walk past a flower, take a moment to enjoy its fragrance and see if you can spot the bracts, while you’re at it. If you grow members of the cabbage family, you need to know about hollow stem. Hollow stem is a physiological condition that occurs within the main supporting stem that holds up your cabbage, broccoli, or cauliflower. At first, small cracks develop in the center of the main stem. As the stem grows, the cracks enlarge, creating cavities that are prone to pest infestations and disease, especially rotting. If you cut open the stem of a plant that seems affected by hollow stem, the damage is obvious. Too much nitrogen and hot temperatures are a bad combination for cole crops. The nitrogen causes rapid growth, but the heat puts too much strain on these cool weather crops. As cracks develop within the stem, pith is lost and the stem becomes weakened. This allows pests and disease to enter, damaging your harvest. For many years, boron deficiencies were blamed for hollow stem. We now know that this is not true. If there is a boron deficiency and hollow stem has occurred, you will be able to see darkening around the edges of the damaged area, but the deficiency does not cause the condition. If you suspect your soil is deficient in boron, send a sample in for a soil test. Keep your brassicas healthy by allowing them to grow slowly and steadily. Baking soda claims range from controlling powdery mildew to battling ants and slugs, killing weeds, and helping your tomato plants grow sweeter fruit. This “natural” cure-all is, unfortunately, not able to live up to all those claims. Before we get started, let me step up on my soapbox about the use of the word ‘natural’. As a proponent of organic gardening and least harm, it irks me when people say natural is better, because sometimes it isn’t. Malaria, death cap mushrooms, and the flu are all natural. ​ Just because something is natural does not necessarily mean it is what you want in your garden. ‘Nuf said. Jump dump baking soda on top of weeds and they will die! True? Yes, probably. Good idea? No, definitely. Baking soda, or sodium bicarbonate, is a type of salt. Remember reading about victors salting the fields of their enemies? This was done so that the losers couldn’t grow any food in those fields. Sprinkling handfuls of salt around your garden is never in your plants’ best interest. Baking soda is highly alkaline. You will find countless articles pointing to the use of baking soda as a way to boost flower production and improve fruit sweetness because of this increased alkalinity. This is only partially true. While improper soil pH can impact fruit and flower production, simply adding baking soda is not the solution. Low flower production can have many causes: not enough or too much sunlight, improper fertilizing, irrigation, or placement, pests or disease, or nutrient imbalances in the soil. Fruit sweetness or acidity is more often a function of irrigation levels and overall plant health, than anything else. To boost the flavor of your tomatoes and many other crops, forget the baking soda and try deficit irrigation. If soil pH is making it difficult for your plants to absorb nutrients, you can try altering it, or you could select plants better suited to your local soil. Altering soil pH is difficult and it requires accurate testing and regular treatments. Simply sprinkling baking soda on your soil is more likely to raise the salt content to toxic levels. You have probably read that you can mix baking soda with sugar to create the perfect DIY ant poison. Supposedly, the ants take the mixture back to their colony, where they eat it and then explode. Nope. Doesn’t really happen. Think about it. From an ant’s perspective, the sugar granules are probably about the size of a tennis ball and easily discernible from the baking soda bits. Plus, I could not find a single piece of scientific research to back up the ‘exploding’ claim. As for slugs and snails, well, baking soda is a salt. Salt does terrible things to slugs and snails. Better to feed them to your chickens or just step on them and be done with it. Countless ads and articles point to baking soda as a fungicide. This is because most fungi grow best in a slightly acidic environment and baking soda has a pH of 8.4, which is more alkaline. When conditions become too alkaline, fungi stop growing. Until conditions improve, that is! Then, they take up exactly where they left off. Because of this, baking soda is considered fungistatic, and not a fungicide. Also, while baking soda’s fungistatic properties are well documented in lab situations, those results have not translated to outdoor growing conditions, such as are found in your garden. If you can completely cover a surface with a baking soda solution, you may be able to temporarily halt the development of any resident fungi, such as those that cause black spot or powdery mildew. But, right away, problems begin to occur. First, ever-increasing amounts of baking soda are needed for the same effect. Also, being water-based, the solution needs to be replaced after every rain, and each treatment adds more salt to the soil than is healthy for plants or important soil microorganisms. You can, however, mix baking soda with horticultural oil for moderate, but inconsistent, results. Just be aware that phytotoxicity can occur. [Phytotoxicity means ‘poisonous to plants’.] When combatting powdery mildew, better results can be obtained by using potassium phosphate, potassium carbonate, sulfur, or even milk sprays. That being said, baking soda solutions can slow the development of certain fungi on produce after it has been harvested. Commercial growers frequently treat thick-skinned produce, such as citrus, with a boiling bath of baking soda in solution to prevent fungal growths while the fruit is in storage or being shipped. This is because the fungi that cause the blue and green molds on citrus are particularly sensitive to alkalinity caused by baking soda. In fact, that’s where the whole baking soda craze got started - from a test on citrus molds conducted in the 1930s. You may be surprised to learn that the use of a coarse organic mulch, such as arborist wood chips, provides better disease suppression than baking soda treatments. This occurs because the wood chips make life more difficult for fungal spores. Baking soda performs wonderful tasks in the kitchen, making muffins, deodorizing the fridge, and putting out grease fires. Let’s leave it there, whee it can do the most good, and not in the garden. Sprinkle cornmeal in the garden to stop weed seeds from germinating! Cornmeal prevents fungal diseases, too! Like many other garden fantasies, the fallacy about cornmeal originated in fact, but the above claims have not been able to withstand the tests of time and science. In 1985, Dr. Nick Christians, from Iowa State University, found that corn gluten meal, a byproduct of the corn milling process, showed herbicidal effects during a turfgrass experiment. The corn gluten meal was found to desiccate newly forming roots of small-seeded plants in highly controlled greenhouse environments. As such, corn gluten meal can act as a pre-emergent herbicide, an idea that was patented in 1991, but those results have not been repeatable in outdoor environments, such as family gardens. Corn gluten meal is not the same thing as the cornmeal you find at the grocery store. Instead, it is what is leftover after the corn has been ground up to make cornmeal. Corn gluten meal is a byproduct used in livestock and pet food. It is the primary protein found in corn and does not actually contain true gluten. Popular claims also state that cornmeal will help control fungal diseases, such as brown patch, black spot, and dollar spot. That’s strikes me as funny, because cornmeal agar is produced as a medium specifically designed to grow fungi for laboratory work! Finally, for the record, ants do not “explode” or die in any other fashion when they eat corn gluten meal, cornmeal, or other foodstuffs. In fact, ants, rats, squirrels, and many other garden pests love cornmeal and corn gluten meal, so choose your battles wisely. If you want to get rid of weeds, cut them off at ground level before they go to seed, and apply a thick layer of mulch. For generations, mothballs have been celebrated as a way to keep rodents, snakes, and insect pests out of the garden. In one article, you are urged to add a few mothballs to a potted plant and then cover the whole thing with a plastic bag for a week as a sure-fire way to get rid of insect pests. In another post, you are told that adding mothballs to the garden will repel mice and rats. Then a friend urges you to scatter mothballs throughout your garden to deter squirrels, snakes, and rabbits. Is any of this a good idea? You might remember smelling mothballs in your grandmother’s closet, attic, or basement. That distinct scent is unmistakable. Mothballs are spheres or disks of pungent chemicals that slowly evaporate into a gas that is toxic to moths and moth larvae. This is why people have used them to protect clothing and other fabric materials while in storage. The chemicals used to make mothballs can be naphthalene or paradichlorobenzene, both of which are carcinogenic neurotoxins that have no business near your food. There are clear and important instructions on how to use mothballs properly, if you must. For one thing, containers must be completely sealed to prevent long term exposure and the associated health risks. The truth is, it is illegal to use mothballs as a pesticide in many states. According to the National Pesticide Information Center, using mothballs outside poses a risk to children, pets, and local wildlife. Mothballs can also contaminate soil and water. So, the next time someone suggests using mothballs in the garden, you can protect them by educating them. Lack of calcium causes blossom end rot. Therefore, adding egg shells to the garden will prevent blossom end rot and feed my plants, and snails won’t cross a line of broken egg shells, right? When a chicken lays an egg, the shell provides protection. That shell is made up of calcium, magnesium, potassium, sodium, and sulfur, which are all important plant nutrients. The thin, inner lining also contain organic matter, equally important to healthy soil structure. Plus, if you don’t wash your egg shells, they will also contain nitrogen, which is an important plant food. All of these nutrients are would be a great addition to the garden, if the egg shells actually broke down into small enough particles - but they don’t. As stated above, egg shells are designed to provide protection. Unless you are dropping them off the roof of the gym for a high school physics class, egg shells are surprisingly tough. So tough, in fact, that they don’t break down in boiling water. The moisture and microorganisms normally responsible for decomposition do not have a ghost of a chance at breaking down an egg shell in your lifetime. For example, 170 years ago, Thomas Jefferson raised chickens and ducks. An archeological excavation of the site found that egg shells from those birds were still intact in the soil. This tells us that, no matter how many times you flip that compost pile, those egg shells will never significantly improve anything in the garden. Even if you let them dry and crush them into smaller bits, those bits are very unlikely to breakdown enough to be useful to your plants. Unless you have very acidic soil (<6.8 pH) and the egg shells are ground up into a very fine powder, they will add nothing to your soil. Blossom end rot is a condition that occurs when plants are unable to move calcium around to where it is needed. This is rarely the result of insufficient calcium in the soil. Most soils have plenty (or too much) calcium already. More often, it is a case of irregular or insufficient watering. Before adding calcium, in any form, to treat blossom end rot, get a soil test from a reputable lab and check your irrigation schedule. Crushed egg shells are also touted as a barrier against slugs and snails, cutworms, and even deer. Those claims are false. The only thing you might find is some birds will be attracted to the shells, either through natural curiosity or as a calcium source during egg-laying season, and some rats, looking for a snack. Personally, I crush my egg shells and feed them back to my chickens. I don’t know if they actually eat them or not, but I think they do. Just in case, I offer oyster shell, as well. Epsom salts are wonderful in the bath, but they do not belong in the garden. Popular culture touts epsom salts as a garden miracle worker, but the truth is, adding Epsom salts to soil nearly always ends badly for plants. The sheer volume of claims made about Epsom salts should be the first clue that there is a problem. Epsom salts are said to improve flower blooming, germination, photosynthesis, the uptake of other nutrients, fruit production and flavor, and to act as a valuable nutrient for overall health. Epsom salts are said to “enhance a plant’s green color” and “help plants grow bushier” while deterring pests, reducing blossom end rot, transplant shock, leaf curling, and chlorosis (yellowing). Epsom salts are also said to be a safe, reliable weed killer. With all these miracles provided by Epsom salts, why isn’t everyone using it all the time? Many advertisements and articles also state that Epsom salts are not persistent in the soil, so you cannot overuse it. Wouldn’t it be wonderful if all those claims were true? Unfortunately, they are not. Adding too much magnesium can cause just as many problems as having too little. More often than not, your soil probably has more magnesium than plants need. When I bought my house in 2012 and sent a sample out for a soil test, my results came back with 798 parts per million (ppm) for magnesium. The optimal range is 50 - 120 ppm. Whoever lived here before me kept adding more fertilizer (or Epsom salts), long after it was needed. Crops that commonly need magnesium include apples, beets, citrus, peppers, potatoes, tomatoes, and watermelon. Usually, deficiencies only occur when these and other crops are being grown intensively, and rarely in the home garden. There is no scientific evidence of Epsom salts repelling slugs, insects, grubs, voles, rabbits, or anything else. As for the blossom end rot claims, adding Epsom salts may actually interfere with your plants’ ability to take up calcium, making it more likely that your tomatoes will develop blossom end rot, rather than preventing it. Epsom salts may sound like a garden cure-all, but those claims should be filed under “too good to be true”. A healthy, productive garden does not come with quick fixes. Before jumping on a bandwagon, be sure you take the time to read the science behind those claims. And get a soil test. Your plants will be healthier and more productive, and you can save Epsom salts for the bath, where they belong. Some trees produce heavy crops each year. Other trees go back and forth between heavy bearing years and light bearing years. This is called alternate bearing. Also known as biennial bearing, this tendency can explain why your fruit or nut tree doesn’t produce the same amount each year. It is not caused by pests or disease. It is simply the way some trees grow, mostly. Generally speaking, fruit and nuts are produced on long stems or on short, stubby stems called spurs. The spurs of alternate bearing trees tend to produce blossoms one year and leaves the next. This allows the tree to gather more of the sun’s energy, carrying it through its two year cycle of production. Therefore, it is not the tree, as a whole, that alternates production each year. Instead, it is the individual stems and spurs. Other causes of alternate bearing include weather conditions, such as a heavy frost that damages the blossoms, can result in a low production year. Since resources were not used to produce as much fruit that year, the following year will tend to be a heavy production year. Some trees may even take two years off after a particularly heavy year. In other cases, mineral deficiencies or excessive fertilization, especially nitrogen, can result in a cycle of alternate bearing to begin. Most perennial fruit crops start making fruiting buds during the previous season. If conditions are especially good or bad, those developing buds will become stronger or weaker, respectively. There is also some research that suggests the developing ovules of a heavy production year produce hormones that inhibit next year’s flower production. Scientists are still learning the details about what causes alternate bearing. Some commercial growers reduce the impact of alternate bearing trees by thinning blossoms and fruit on heavy production year. This is done to counteract the fact that fruit produced during heavy years tends to be smaller, while fruit produced during low production years tends to be of poor quality and more susceptible to pest and disease damage. Evening things out improves crop quality and tree health. Citrus, apple, pear, avocado, apricot, plum, mango, cranberry, blueberry, olives, pecan, and pistachio are common plants that exhibit alternate bearing behavior in the home garden. Grapes almost never do. You can reduce the negative impact of alternate bearing on your fruit and nut trees with proper pruning, irrigation, and feeding, along with regular fruit thinning, soil tests, and protective treatments against pests and diseases. Gumming does not mean your tree has lost its dentures. Instead, it is responding to injury. Gumming is particularly common among stone fruits, such as nectarine and almond, though is can also be seen on mango, citrus, and eucalyptus. Environmental stress, mechanical injury, insect attacks, and disease can all trigger a tree to start gumming. This creates a protective barrier, as well as tries to push any invaders out. You can use specific details surrounding gummosis to identify the problem. For example, gummosis caused by insect infestation or mechanical injury will often exhibit bits of bark or sawdust mixed in with the gum. Look for other damage around the gumming site: Do leaves look sick or chewed upon? Has the bark’s integrity been breached? Do you see discoloration under the bark near the gumming? Environmental conditions such as sunscald, frost damage, improper pruning, planting too deeply, excessive irrigation, and over-bearing can all cause gumming. Mechanical injury by lawnmower collisions, rubbing branches, and outgrown tree supports can all lead to gumming. Insect infestation by peach tree borers, flathead borers, and other boring insects can cause gumming. Diseases such as Eutypa dieback, cytospora canker, Fusarium dieback, and bacterial spot may cause discoloration under the bark, as well as leaf dieback and stunting. You can help your fruit and nut trees stay healthy by avoiding mechanical injuries, and monitoring for pests and diseases on a regular basis, along with proper feeding and irrigation. If you suspect disease, scrape some of the bark away from the area surrounding the gum. If you see discoloration or streaking, it is probably a disease that needs further attention. In many cases, diseases can be halted by removing affected branches below the infected area, just be sure to sanitize cutting tools between each cut. If the gum emerges from circular holes and contains insect larvae, the tree is taking care of the problem itself, though further monitoring is a good idea. Who knew apples could get the measles? Unlike the human variety, which is caused by a virus, apple measles is a symptom of manganese toxicity. Manganese is a micronutrient used by plants to make chlorophyll. It is an important component of chloroplasts. Manganese is used by all living things as an antioxidant, to counteract the toxic effects of oxygen. Manganese can also be phytotoxic, which means it can be poisonous to plants. The first sign of apple measles is tiny red pustules on new twigs. If you look closely, you can see that the tissue in the center of each pustule is dead. Take a look on the inside of the twig and you will see that the lesion spreads, under the bark, into the cortex or the phloem tissue. If you take a cross-section of the twig, you will see brown streaks or flecks. As the affected twig matures, the bark thickens, cracks, and sloughs off, leaving flakey cankers. This flaking off of bark can last for several years. Since apple measles is a symptom of too much manganese in the soil, you need to alter the soil chemistry to help your apple tree. Apple measles occurs most commonly in acidic soil, so increasing the soil pH with lime or other alkaline soil amendment will help reduce future damage. Unfortunately, it is very difficult for trees to recover from apple measles, so get your soil tested every 3 to 5 years, so you know what they are dealing with - before the damage is done. Before we learn about bourse shoots, we need a quick review of apple tree anatomy. Apple trees tend to grow long stems. If those stems grow upright, your apple tree is of the alternate bearing variety. If those stems tend to hang downward, your apple tree is a regular bearing type. One study, published in the Journal of Horticultural Science, explains how the removal of too many bourse shoots significantly reduces return bloom. Along those stems, whichever way they happen to grow, are little stubby growths called spurs. The majority of an apple crop is found on the ends of spurs. Each spur can produce fruit for 8 to 10 years, or more. Those spurs grow out of swollen areas, called bourses. Not to be confused with bourses, bourse shoots are vegetative stems that emerge just below flower buds. In some cases, new spurs can suddenly shift their growth to become a bourse shoot instead of a spur. These bourse shoots feature a whorl of leaves. In the center of those leaves, a bud may form later in the season, but they tend to be less productive than spurs. This transition from vegetative growth to floral growth, called floral inflation, is believed to be caused by an abundance of sunlight and sugar. Other causes of floral inflation include fruit thinning, summer pruning, and bending upright shoots to a more horizontal orientation. A common term among apple growers is bourse-over-bourse. This refers to bourse shoots emerging from existing bourse shoots, in a waterfall style growth pattern. Too many bourse shoots on one stem can lead to spur extinction. Spur extinction describes the point where a spur is no longer productive. If you see multiple bourse shoots on a stem, you can improve fruit production by pruning back to the innermost bourse shoot. Standard dormant season apple pruning involves removing all dead, diseased, or rubbing branches, as well as 15 to 20% of the previous year’s growth. Next, you should remove excessive bourse-over-bourse growth, and bourse shoots that are especially long, as they tend to be less productive than shorter or medium-length bourse shoots. Don’t remove too much, however. One study, published in the Journal of Horticultural Science, explains how the removal of too many bourse shoots significantly reduces return bloom [next year’s crop]. Bottom line: next year’s apple (or pear) crop is highly dependent on the number of leaves produced during the current year. If your apple tree has more bourse shoots, it is more likely to have more leaves, ergo, more fruit. But this is only true if those bourse shoots are spread evenly throughout the tree.